Since its introduction to the U.S. in 1999, West Nile virus has spread rapidly across North America, threatening wildlife populations and posing a serious health risk to humans. In 2012, there were more than 5,500 human cases of the disease reported in 48 states, the highest number in more than a decade. Now, a team of researchers from the Center for Tropical Research at UCLA's Institute of the Environment and Sustainability has created a model to help predict where the disease may occur under future climate change. Their findings were published Feb. 27 in the journal Global Change Biology. "To our knowledge, this is the first continental risk assessment of West Nile virus based on nearly a decade of data," said Ryan Harrigan, a postdoctoral researcher at the center who, along with center director Thomas Smith, collaborated with researchers from Germany's University of Tubingen and Britain's University of Leeds. 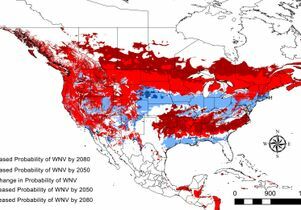 "What we are presenting is the first North American predictions of the disease under present and future climate conditions." Using the relationship between current climate conditions and cases of West Nile virus, the researchers were able to generate models to predict where this disease may occur under climate conditions in the future. Their results suggest that higher temperatures and lower precipitation lead to a higher probability of West Nile virus cases in humans, birds and mosquitoes and that as a result climate change, the disease will spread northward into previously unaffected areas. Their analyses also identify current and future hotspots of West Nile virus transmission and present an important new approach for monitoring the risk of this and other vector-borne diseases. In looking at data on West Nile virus patterns, coupled with observed climate data and a variety of species distribution models for the years 2003–11, the researchers noticed something interesting. "Our model did a good job of predicting where we saw cases in 2012, including new cases in places that had never before had recorded cases, including Maine, which experienced its first human case in 2012," Harrigan said. Building on this discovery, they took their method a step further by collecting data related to future climate realities and developing models that reveal possible future activity in 2050 and 2080. "In California, we estimate approximately 68 percent of the state's area will have an increase in the probability of West Nile virus by 2050," he said, noting that while the research identifies areas that are expected to have outbreaks, the severity of those outbreaks is still unknown. The most important climate variables predicting West Nile virus occurrence, said the researchers, are the maximum temperature of the warmest month and measures of annual and seasonal precipitation. This study does not take into account factors like future land-use changes, insect control efforts, socioeconomic conditions, host-switching by West Nile carrying insects or host community diversity, which are difficult to predict in the long-term, Harrigan said. The information, he said, is useful to a variety of groups, including the general public, who may use it to better understand their personal geographical risk; local vector control agencies, which can identify potential "hot spots" in various counties and districts; and wildlife biologists, who can use it to determine need and risk in certain areas and how this may impact animal populations." "The intent of the research is not to cause alarm but rather to raise awareness of the existence of the disease and where the risks are to encourage people to take precautions," said Harrigan, adding that although there is no cure for the virus, symptoms can be lessened, if caught early, through supportive therapy. Knowing the symptoms, which commonly include fever, headache, body aches, fatigue and back pain, and — in more severe cases — disorientation, confusion, tremors, sudden muscle weakness, and even coma and paralysis, and taking precautions, such as using insect repellent, getting rid of standing water in and around your home, wearing long sleeves and pants during times when mosquitoes are most active, can also reduce one's chances of contracting the disease.